GetLinked® Software Forum • View topic - How does the Calculation feature work? How can I create a manual entry line item in POSLink? Post subject: How does the Calculation feature work? How can I create a manual entry line item in POSLink? If you need a calculated amount in POSLink on a recurring basis (ex. manual deposit, paid out, credit card fees, etc.) you can create a "Calculation" and add, subtract, multiply and divide any amounts imported or use a constant. You can even create a "zero calculation" (ex. "manual variance") you want to adjust yourself on the Daily Sales Summary window. Click on the "New" button (highlight #1 in the image below) to create a new calculation. 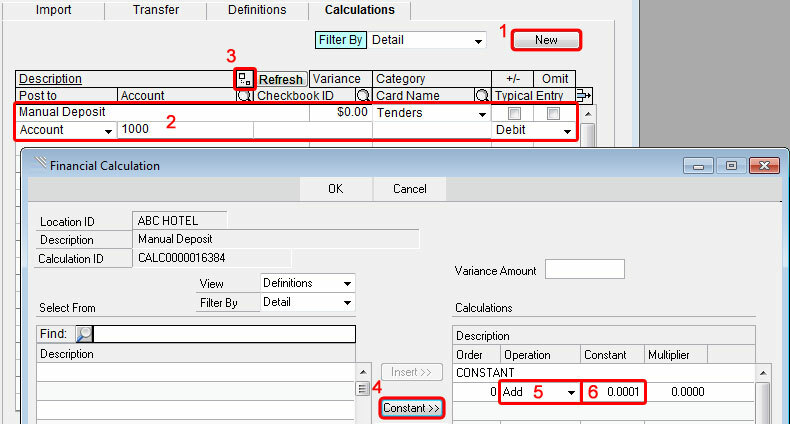 Enter a Description for the calculation and then select a Category, Account, and Typical Entry (highlight #2). Click the Expansion button (highlight #3) to open the Financial Calculation window. Click the "Constant" button (highlight #4) to add a constant to the calculation. Select "Add" as the Operation (highlight #5). Click the OK button to return to the Financial Location Setup window. Click "Save" at the top of the Financial Location Setup window to save your changes. When you import under the Daily Summary window your new calculation will show up in the category you selected above with a $0.00 amount. You can change the amount as needed before transferring the day.